In February, I was slated to speak at a conference in Palm Beach, Florida. The conference was held at The Breakers Resort. I gotta say, if you have to work Tax Season hours, it's nice to be working them near the beach. On the first day, I explored the resort a little bit, taking some video of the ocean spilling over the breakers (how appropriate, huh?). At check-in, I was told that my room had been upgraded, but that it had two double beds. Since I was traveling alone, that didn't matter to me. I am not quite sure what "upgraded" means. The room was beautiful, but it overlooked the front entrance to the hotel. I always love when there's a TV in the mirror in the bathroom. It adds a little something to the primping process. This one was interesting though. It was not HD (maybe they don't make in-mirror screens in HD?) and it didn't have all the same channel line-up as the one in the main room. The room, like the rest of the hotel, felt very "Old Florida". I liked it. Because I had files to review, I spent much time in my room. One day I ordered a shrimp Caesar salad from room service. It did not disappoint. When they said "colossal shrimp", they meant it! Isn't that starfish glass pretty? I kept it to drink water for the rest of my stay. And the napkin was wrapped with a little shell chain. And by the way - this was the best.bread.ever. My cousin Kellye happens to live in West Palm Beach, so we were able to spend some time together while I was in town. One evening after dinner, we came back to the hotel bar, HMF. I enjoyed having a nightcap glass of wine here. Our server, Giana, was adorable. 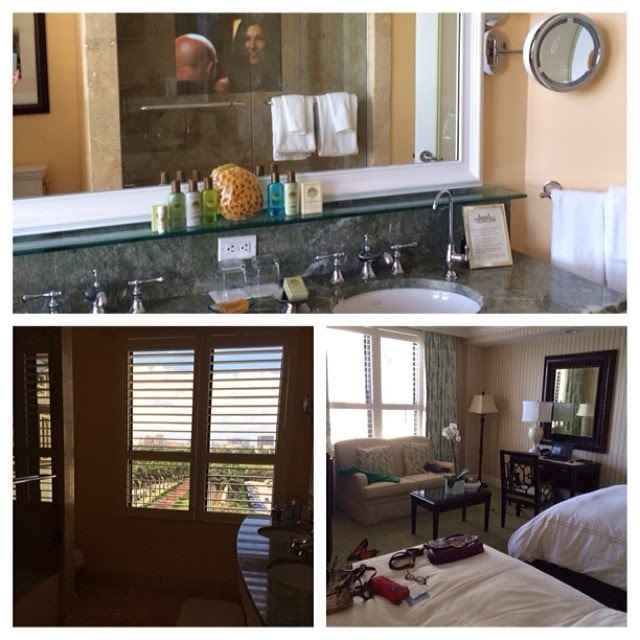 The Breakers is most definitely a 5-Star hotel, and I was spoiled in my two nights there. The service was impeccable in all areas. The lobby area was just beautiful. The rooms were safe; location wonderful, and ambiance was amazing. I would love to return to this resort someday with my husband and/or daughter and spend a little more time enjoying the resort and less time working. Chris and I are pretty big Supercross fans. From Wikipedia: "Supercross is a motorcycle racing sport involving off-road motorcycles on an artificially-made dirt tracks consisting of steep jumps and obstacles. Professional supercross contest races are held almost exclusively within professional baseball and football stadia, although one contest is held at a major motorsport venue (Daytona International Speedway) in the island that separates pit lane from the circuit." A few years back, we started attending the Dallas stop each year. Then we added Houston to the mix, and three years ago, we attended our first Supercross Finals in Las Vegas. Last weekend (February 15-16), we went to Dallas. We drove up Saturday afternoon and checked into our hotel, the Towne Place Suites in Arlington, TX. I had selected this hotel for several reasons. First, it is pet-friendly and we had originally planned to bring our dogs with us for this trip. Second, I'm a Marriott Rewards member, so I like to get my "points". And third, it is about a half mile from the AT&T Stadium (formerly Cowboys Stadium). We left Austin a little late and checked in at the hotel around 6pm. When I was checking in, there was a young man asking for a shuttle to the stadium. They said they could call a taxi, so I just offered to take him over with us. He was a nice "kid" named Ryan, who rides motocross and attends the Salt Lake City event every year. He was in Arlington training to work for an oil company. We dropped him off right near the stadium entrance and proceeded to our prepaid parking lot. Our seats, which I bought last May on the day and time that they went on sale, were Row 5, Club Level, 50-Yard-Line. 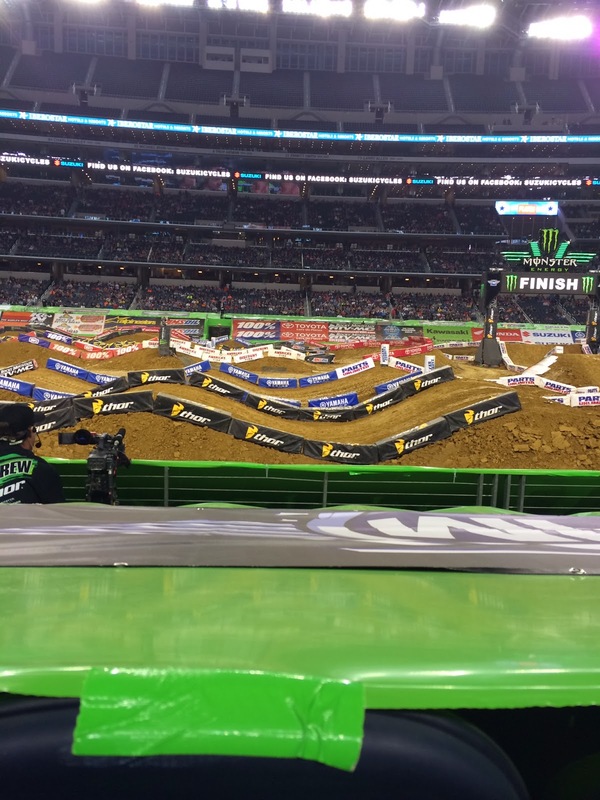 Row 5 is actually Row 1 since they cover the first four rows for Supercross. We've been following the season and are thrilled that Ryan Villopoto, who has dominated the sport for the last few years, is not dominating as much this year. He is still the points leader. 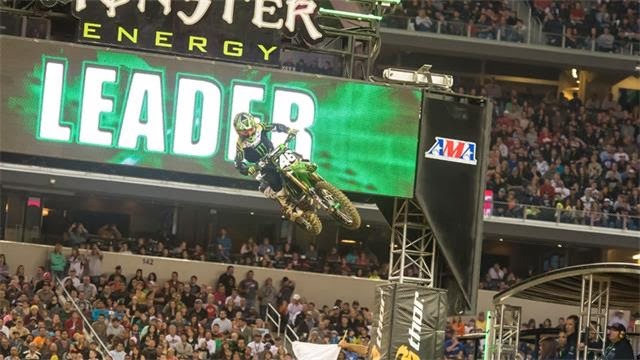 Our favorite rider, Chad Reed, the Aussie, has been doing super this year, but he had an unfortunate battle with the whoops the week before and tweaked his shoulder during practice that day, leaving him unable to race. The races were fun to watch. My favorite 250 class rider is Blake Wharton, and this was the East Coast class debut for the season. I looked forward to seeing him ride, but he ended up not doing so well. 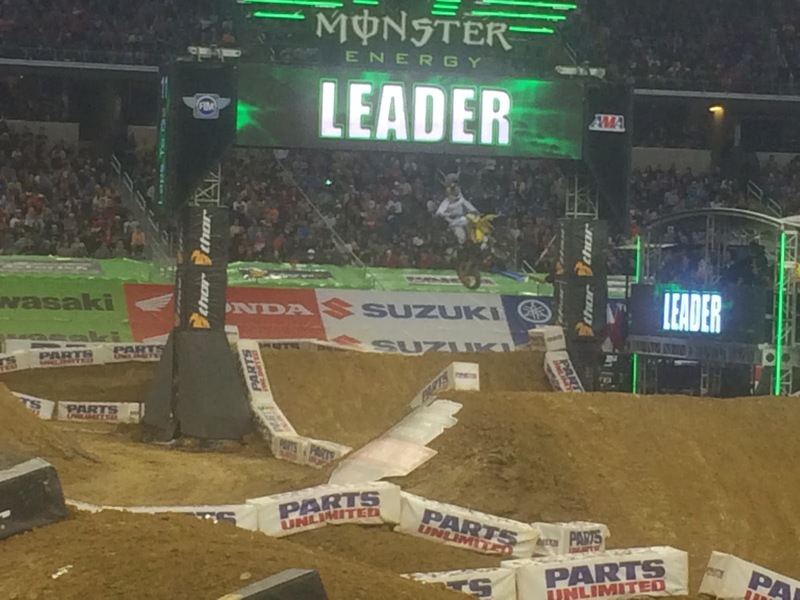 A highlight was when rookie Adam Cianciarulo took first place in the 250 class. 17-year-old Adam was so gracious and fun to watch giving his post-race interviews. It's nice to see a humble, good guy win. Turning to the 450 class, one of my long-time favorites, James ("Bubba") Stewart took an early lead and a repeat of the prior week's win. Another of our favorites, Ryan Dungey, took second place, with Justin Barcia - another great sport, rounding out the podium. I didn't take my good camera, but here is an iPhone shot of Bubba (nobody calls him that anymore) crossing the finish line during the race. And finally, I managed to get a "slow-mo" setting video of Bubba James Stewart during the race. The race ended around 10pm and we didn't rush with the crowds to our truck, knowing from prior years that it takes forever to get out of the parking lot. Meanwhile, we "Yelped" area restaurants and bars, and Chris stumbled upon Maverick's Bar and Grill around the corner from the stadium. It got great reviews, so we decided to try it out for a post-race cocktail or two. It was in a somewhat industrial area, and felt a little scary pulling up, but we went ahead inside. Right when we crossed the threshhold, I noticed that we were the oldest people in the room by a good 30 years. Turns out this was a college bar full of UTA students. Thus "Mavericks" - the school mascot. We found seats at the bar and ordered our cocktails. I was a little worried about being out of place, until I realized not a single other person in there was worried about us. Gotta love the college crowd. It was a fun scene to watch. Back to the hotel for a night of rest, then an uneventful drive home Sunday morning. We are looking forward to our next Supercross event April 5 in Houston. Tuesday, June 12, we awoke in the aft, starboard berth of our sailboat. With no air conditioning and the windows vented, the sun tends to wake you up. Also, when in port, noises in and on boats nearby and on the quay (pier, pronounced "key") will alert you that morning has arrived. Before the trip, we had been told that there would be a meeting held every morning, a "briefing". I am by no means a morning person, and I had been worried that these meetings may be as early as 7 or 8am. Not to worry, our lead crew established our morning briefing time at 9:30am. Whew! We had the option of purchasing groceries and preparing and eating breakfast on our boat, or of eating at any of the tavernas or cafes. Our meeting was to be held at the Hotel Poseidon, so we chose to have breakfast there. I ordered a fruit plate and fresh-squeezed orange juice. I think Chris ordered Greek yogurt, which also came with fruit and some honey. I couldn't believe my fruit plate when it arrived! Huge and beautiful! Little did we know at the time, that this kind of fruit, yogurt and fresh-squeezed OJ was offered at every little Greek port we would visit. Just heavenly. At shortly after 9:30, the group gathered for our first morning briefing. I think each table introduced ourselves aloud, or maybe there was a roll call? We met (or re-met) our Skipper, Harry from New Zealand (the Kiwi), our Engineer, Bobby (also from NZ, I think? ), and our Hostie (hostess), Kate, from Australia. They all live on Lead Boat Kyra, which is a bit smaller than any other boat in the flotilla. This is pretty impressive, because they carry with them all kinds of supplies, tools and replacement parts for on-the-spot repairs of any of the flotilla boats. We were told that we would head for Vathi that day, and were given the compass coordinates to get there. Harry told us what to expect of the weather and the winds. He also suggested the latest arrival time that we should plan to make our appearance at Vathi. Sometimes, they wanted us to arrive by a certain time due to impending weather, wind, and/or storms. Other times, they had parties and group dinners planned for us. But we figured out at some point that they like to set a "curfew" (if you will) so that they could plan for when they could be "off the clock". It's pretty admirable that the lead crew works so hard without days off. I'm sure it's a fun job, but they are "on call" 24/7. Kate told us what amenities would be available in Vathi, as well as some fun things we could think about doing there (volcano hiking, anyone?). When I say "amenities", what I mean is - she told us which tavernas were the favorites, where the trash bins were, where we could shower and how much it would cost, and where we could find someone to help us hire a taxi if we wanted to leave town. This was part of the Hostie briefing every morning. Some ports had banks and ATMs; some didn't have shower facilities. Some ports had grocery stories, fresh water for the boat, even ice. Some did not. So it was always important to listen to Kate's part of the briefing. During Bobby's part of the briefing, he asked if any boats needed any supplies or repairs, and he scheduled a time to take care of those. Bobby may have the hardest job of the lead crew! 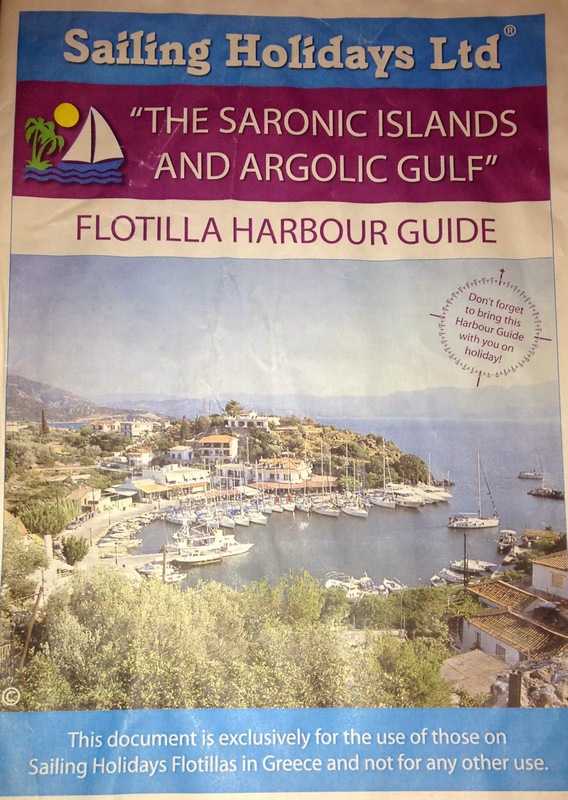 Before we left home for our vacation, we had received this Harbor Guide. Now, I'm a compulsive planner, so I was excited to get this guide to study and review. But there was one problem. There were about 20-25 ports listed in the harbor guide, and we didn't know which ones we would visit. In fact, on this flotilla, you really don't know which port you will visit on a given day until sometimes the day before, and sometimes after lunch on each day's voyage. It all depends on weather, winds, and how crowded each harbor is. So I didn't spend too much effort studying ahead, mainly because I didn't want to get all excited about visiting a port, only to have to skip that one once we were on vacation. Inside the harbor guide, there are about 2 pages for each port, listing information about the history and geography, along with a harbor map. These maps were essential as we pulled into each port, as we would radio Lead Boat Kyra and they would let us know where they wanted us to dock. 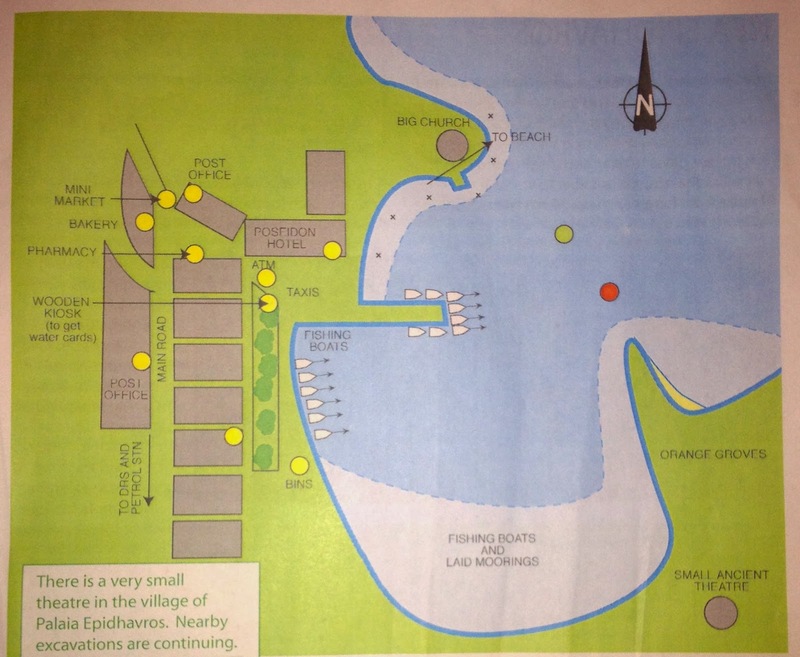 Here is the harbor map for Epidavros. Our boat was moored along the left side, just under where it says "fishing boats". You can see the Hotel Poseidon, where we had our morning briefing. After breakfast, we took inventory of all of the items on our boat and signed off on an inventory sheet. We were missing a couple of items, one of which was a horseshoe-shaped life saver float. I think we were also missing a teaspoon. Kate got these items for us, so we'd be complete as we sailed off that afternoon. The boats came with all kinds of cool things, like nautical charts and old-school compasses, binoculars, harnesses (which we never used), first aid kit, tool kit, lots of linens, tea pot and coffee pot, etc. We had one or two minor technical issues. I think one was that our shower wouldn't drain. Also, one of our water tanks was empty. Bobby was making the rounds to all the boats, prioritizing repairs, and such, so while we waited for him, Chris hoisted our flags. 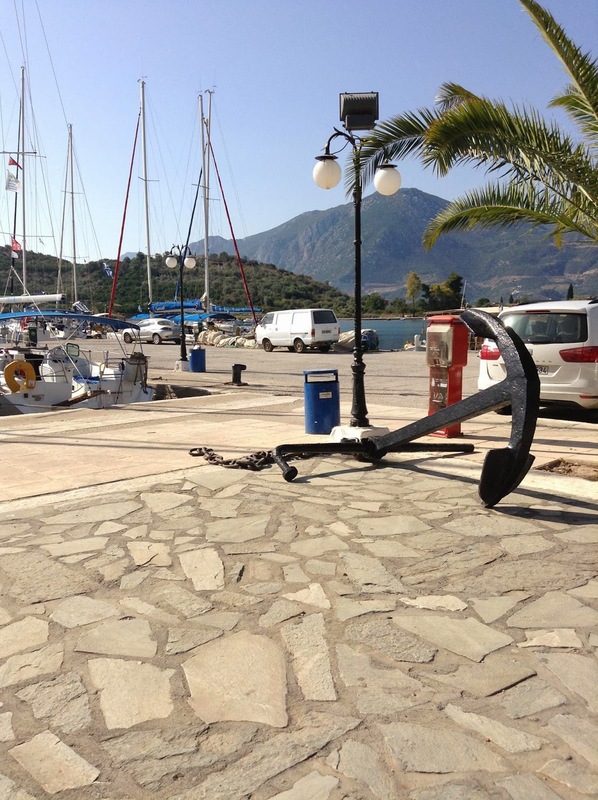 Here are several angles of our boat, moored "Mediterranean style". There's an anchor off the front, and lines on both sides of the stern. This is how we moored at most ports. It makes it very easy to get onto and off of the boat, but doesn't provide much privacy. Konitsa is a beautiful 34-foot Benetau. You can see some of the supplies the boat is outfitted with, including the bucket and sponge on the back, horseshoe life float, the stern anchor, dock lines and fenders. There is a compass above the steering wheel, and storage under the port-side seating. Incidentally, the bow anchor is attached to a winch (a windlass) in the bow of the boat. It is one of the scariest things I've ever seen. We were warned about how dangerous that thing is and I was literally afraid to go within 3 feet of it for the first half of our trip. But eventually I was forced to learn to use it. When we arrived at each harbor, I had to be on the bow, with the windlass remote in hand, ready to drop the anchor while Chris steered the boat. When Bobby came by to check everything out, he did a sailing/safety briefing. There were two other boats just like ours, so our briefings were done on another boat, together. 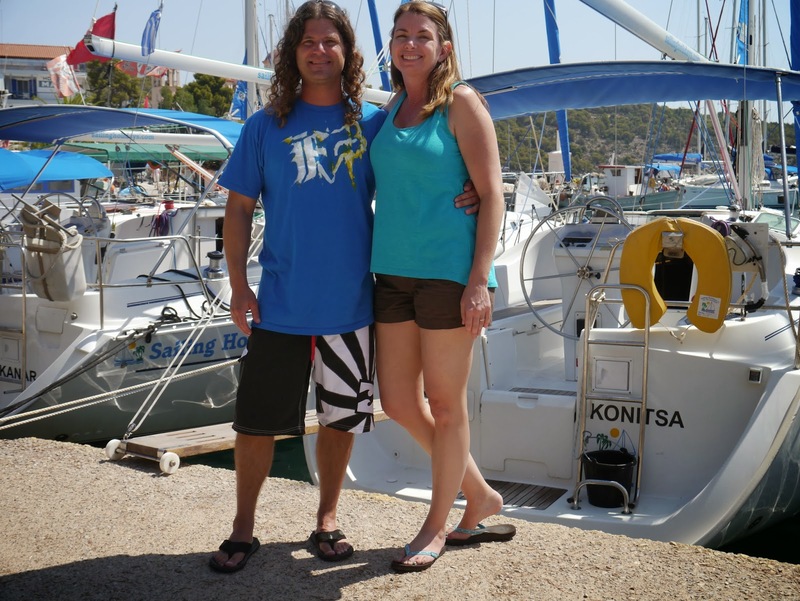 We had arranged to pay for an "extra set of hands" offered by Sailing Holidays for the first couple of days. 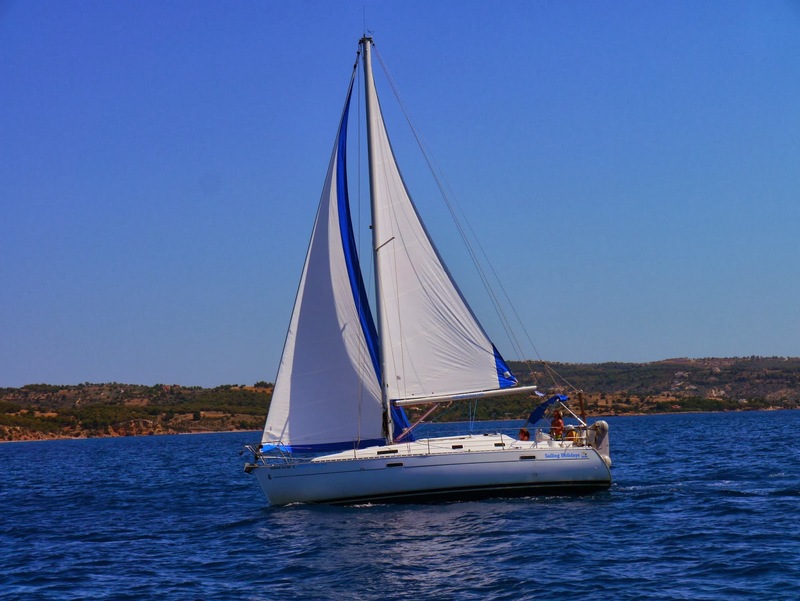 We weren't sure how confident we would feel with just our Sailing 101 certification under our belts. But after talking to both Harry and Bobby, they decided we had enough boating experience (from our lifelong experience with ski and wakeboard boats) that we probably wouldn't need the extra help, so we ended up nixing the extra set of hands. We still spent the money, however, in the form of an outboard motor for our dinghy. The dinghy and paddles are standard equipment on each boat in the flotilla, but the outboard is not. That outboard was money well spent, although we had a love/hate relationship with it over the next 13 days. More to come on that. Once the boat was all set, we walked over to a taverna for a sandwich for lunch, then to a grocery store to stock up on snacks, ice, and the essential beer and wine. Once our group arrived from London and we had greeted our friends, who had hosted us in London in July 2012, we all hopped on the "coach" (bus) and headed to Epidavros. Our drive was about two hours, with a quick stop for restrooms (and a beer) at one point along the way. 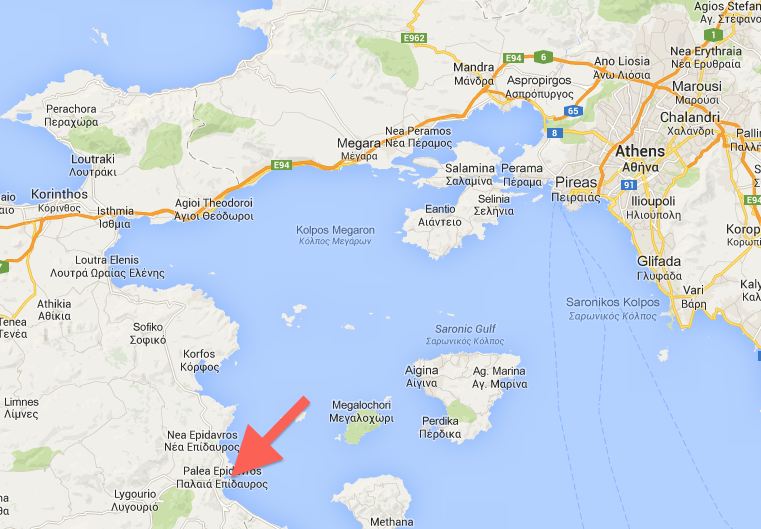 Once we arrived in Epidavros, we were told the name of our boat, gathered our luggage, and headed straight there. Our boat was Konitsa, representing a town in Epirus, Greece, near the Albanian border. This would be our home for the next two weeks! It was dark when we arrived, so we found the lights inside the boat, quickly unpacked what we needed for the night, and made our beds. The engineer, Bobby, stopped by and showed us the essentials we would need for the overnight (lights, water, "head"). Then we headed to a taverna and met our friends from Olympia (their boat) for dinner. We had a great dinner and shared lots of laughs and good Greek food. 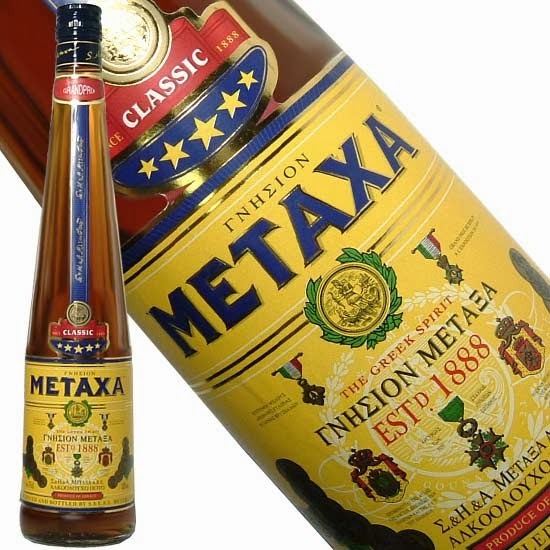 We also learned what Metaxa is (similar to bourbon/whiskey), and the guys each took a shot to get our vacation started. We also learned that the best way to order wine in Greece is to just order the white, or red, table wine. No need to review an entire wine list and look like we were smarter than we were. House wine was almost always excellent. The final part of our tour of Athens was a drive by some of the significant buildings in the city. First was the Parliament Building (or "Old Palace"). Not quite as "old" as much of the architecture we had seen so far, the Hellenic Parliament was built from 1836 to 1840. It was originally the palace home of the first king (Otto) after the Turkish occupation. Next, we drove by the "Neoclassical Trilogy of Athens", which consists of three buildings located side-by-side. As we drove down the street, we first encountered the Academy of Athens. The central pediment of the Academy of Athens depicts the birth of Athena, and Socrates and Plato are seated in front of the building. (I have to pronounce Socrates "So-Crates" in my head, in homage to Bill and Ted's Excellent Adventure.) Athena and Apollo stand high atop the pediments on either side of the entrance. Just to the left of the Academy of Athens is the University of Athens. Established in 1837, The University of Athens was the first university in the newly-established Greek state, the Balkans and the Mediterranean. This building currently serves as the headquarters for the University of Athens. The final part of the Neoclassical Trilogy of Athens is the National Library of Greece, immediately to the left of the University of Athens. The statue in the front is that of Panaghis Athanassiou Vallianos. Yeah, I don't know who that is either, but he was apparently one of the benefactors of the building. By the time our tour was complete, we were hungry, and we decided to walk through the Plaka and back to the same area where we had enjoyed dinner the evening before. We just loved this area. Isn't it quaint? 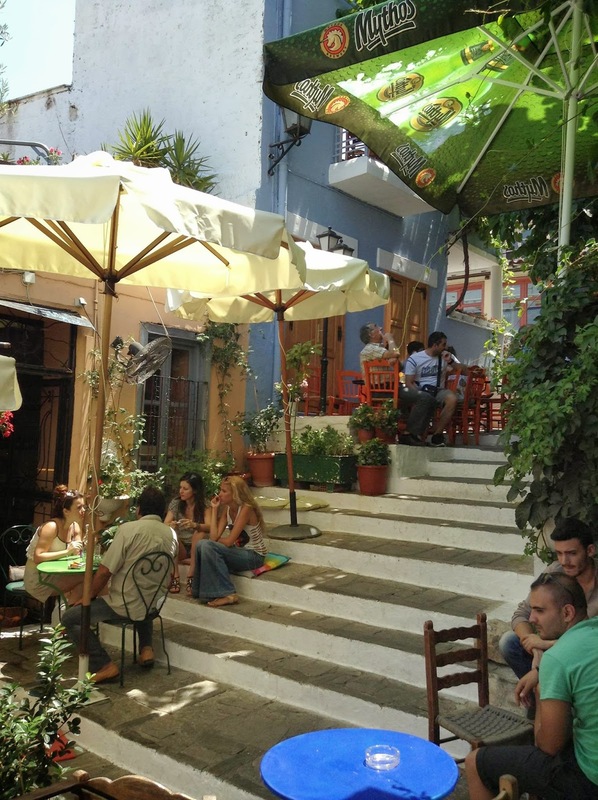 There are tavernas and cafes lining both sides of the staircase. We chose one of the tavernas (or they chose us - those guys know how to bark and becon in you to their establishments) and were seated outside on our own little private patio. Soon, we were brought a Greek salad, fresh pita, and wine. Mmmm. 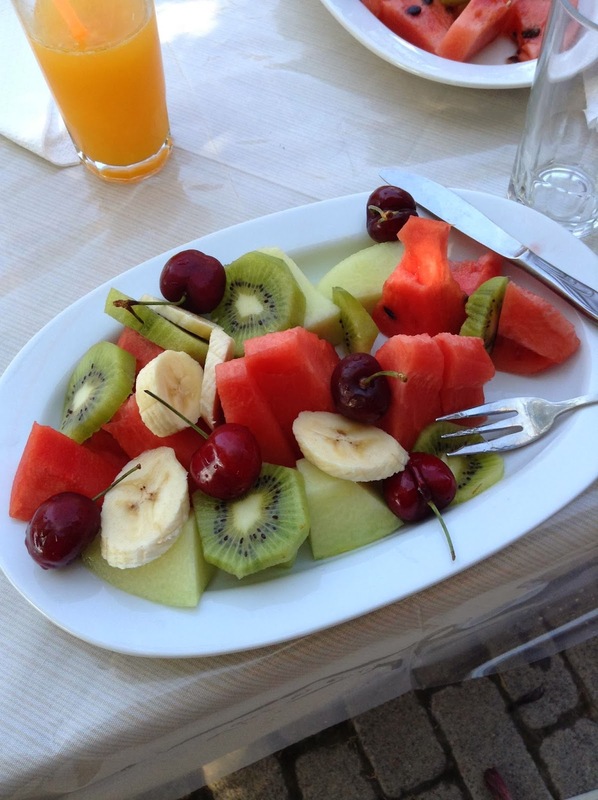 Doesn't that look delicious and refreshing? We learned on our vacation that a real Greek salad does not include any type of lettuce, and we really liked it that way. Now, at home, we will only make or order a Greek salad the authentic way, without iceberg or Romaine. For our main course, we shared the fresh fish. I don't remember what type of fish this was, but it was delicious. They fileted it right at our table. We took our time and enjoyed our meal, and the ambiance, and the fact that we were in Athens, GREECE, y'all! This was the view from our table. You can see how some of the cafes provided pillows for patrons to sit on while enjoying coffee, a cocktail, or a dessert. After our lunch, we walked around the Plaka a little bit more, then ran an errand - we had to pick up a cell phone to use while in Greece. We had done our research and figured out that the most economical way to make and receive calls to/from Greek phone numbers would be to purchase a phone and sim card. We went to the Cosmote store, stumbled through Greek/English communication, and were able to purchase an inexpensive flip-phone for 15 Euro, and a sim card for 5 Euro. I believe there was an activation fee, but all-in, we were right at 26 Euro, which is approximately $34 U.S. The minutes expired 30 days later, but we can take the phone with us for any future international travel and simply buy a sim card for use in that country. Awesome! Next, it was time to claim our luggage from the bellman at our hotel and catch our arranged ride to the airport. There, we would meet someone from Sailing Holidays, our tour group for the flotilla, and together we would wait for the arrival of the British Airways flight with all of the other members of our flotilla. Let's rewind a little bit and see some of the other parts of the Acropolis that we saw as we walked counter-clockwise around the Parthenon. We'll start on he southeast corner of the Acropolis. From here we could see the Acropolis Museum. This is not actually on the hill of the Acropolis, but it in town below the hill. Just in front of the New Acropolis Museum, and on the Acropolis, is the Theatre of Dionysus. In its prime, this theater seated 17,000 people! This theater will be partially restored along with the current Acropolis restoration project, and this portion is expected to be complete by 2015. As we reached the east-most point of the Acropolis, we spied the Temple of Olympian Zeus, where we had been earlier that morning. I like the perspective this photo provides, as you can see the full property, including the Arch of Hadrian (just left of center in this picture). On the east end of the Acropolis, the Greek flag flies. This is a popular vantage point that overlooks the Plaka in Athens. From the end of the wall you see on the left of the photo above, I took some pictures of the Plaka below. The roof gardens are amazing, and one of those is where we had eaten dinner the evening prior. Next we came to the Erechtheion on the north side of the Parthenon. This temple is dedicated to Athena and Posseidon. I love this feature for several reasons. First, it brings back memories of my high school studies of Greek Mythology. Caryatids are structural columns designed in the likeness of women, usually muses. These particular caryatids aren't the originals. That's the second interesting thing about this porch. Originally, there were six caryatids. But in 1801 something happened to one of them. Remember my story about Lord Elgin? Yes, he's back. He decided in that year to take one of the caryatids to his Scotland home, and it was later sold. So you get one guess as to where it is now. That's right. The British Museum. The other five original statues are in the New Acropolis Museum. These six in the photo above are all replicas. And now, we've come full circle at the Acropolis of Athens. We are back standing just above the Propylaea. You can see the Philopappus Monument in the distance on the left, a small bit of Athens ahead, and the Saronic Gulf in the distance. We would be headed toward the Saronic Gulf later that evening. I was getting pretty excited! As we continued to explore the Acropolis, we stumbled upon this little structure. Now you may be asking, what's with all the scaffolding? Well, since you asked, that's part of an ongoing restoration that began a couple of years ago...in 1975!! And I don't remember when they told us they expect it to be complete, but I am not sure I'll live to see that complete restoration. As we approached the Parthenon, we could see the interior and exterior friezes. On this face of the building, the exterior frieze is in poor condition. In the lower part of this photo, you can see the interior frieze around the cella (interior portion of the building). The interior frieze is one of the current focuses of the restoration. We walked counter-clockwise around the Parthenon. This is the southern wall. You can see that several of the pillars and the roofline are missing. This was as a result of a campaign in 1687 by the Venetians against the Ottoman Turks. Even after being warned, the Ottoman Turks chose to use a portion of the Parthenon as a gunpowder magazine to store the explosive until they needed it. Well, those Venetians fired a mortar from the Hill of Philopappus (remember that hill I told you about?) and blew up the side of the Parthenon. Incidentally, that roof and windows that you see int he bottom of this photo are part of one of the buildings at the Acropolis that are used in the restoration effort. We weren't allowed inside, but I'm sure those archaeologists and engineers were thrilled to have air conditioning up there on one of the highest points in Athens on a hot June day. Along the top of the east pediment, we saw portions of the metopes. These depict various mythological battles. You can see a horse's head here. This was the first time we were told about the dispute over the "marbles". Our guide told us that many elements of the original Parthenon are currently held in the British Museum in London. I thought when they said "marbles", they were talking about big round stones of various sizes that were taken to London. I was thinking, who wants to see a bunch of balls in London when we can see all this cool sculpture right here in Athens? Apparently, negotiations have been ongoing between the British and the Greeks since 1983 for the return of the marbles, but the British Museum has so far refused to return the marbles, and the British government does not want to intervene, because it would take legislation to force their return to Greece. The British Museum says that they can take better care of the relics than the Greek can, due to climate control and other things. Come on people, give the marbles back to the Greeks! This is not kindergarten. We continued to move clockwise around the Parthenon to the north elevation. I was just reading something I had forgotten that we were told on our tour. That white material that makes up the "new" portion of the puzzle is actually brought in from the original quarry. So eventually, with wear and weather, it will fade to the creamy color. Hmmmm. One more photo of the north side of the Parthenon. So there you have it. There's the Parthenon in all its glory. It's pretty amazing and was truly surreal to stand on that ancient ground. But don't fret, there are still more things to see at (and from) the Acropolis of Athens.